Indian Railways is the lifeline of India. The railway network unites the distance, geography and diversity of the nation. Built way back in 1853, during the British colonial rule now it has grown to be the World’s third largest network. Truly defining the Indianness, traveling in train is an experience of India. Associated not only with incredible distances, there are many mind blowing facts about the Indian Railways. 1. Indian Railways dates back to 1853. During the British rule, the first train in India ran on 16th April 1853 from Bombay to Thane. 2. Though India was under colonial rule of the British and it was their idea, the first railroad was constructed by two Indians. Jaganath Shunkerseth and Jamsetjee Jeejeebhoy were the first builders. 3. Covering the huge distances from North to south, East to west and crisscrossing routes, the full track length of Indian Railways can circle the equator one-and-a-half times. Even the daily total distance covered by Indian Railways daily equals three and a half times the distance to the moon. 4. Owned by the Government of India, the autonomous organization has over 1.6 million employees, Indian Railways is the world’s 9th largest employer. 5. Indian Railways has a daily passenger population of almost 25 million. It is more than the entire population of Australia. 6. Indian Railways’ Fastest train is New Delhi-Bhopal Shatabdi Express. The all air-conditioned superfast train clocks a maximum speed of 150kmph on the Faridabad-Agra section. This train covers the 704 km New Delhi – Bhopal stretch in 7 hours 50 minutes. Slowest train in India is Metupalayam Ooty Nilgiri Passenger which runs at a speed of 10kmph. Since this train runs in hilly region there are speed limits to comply. The one that comes close is Pratapnagar-Jambusar passenger, with a maximum speed of 12km/h and an average speed of 11km/h. It takes 4 hours for a journey of 44 km. 7. The Longest run by an Indian Railways’ train is the Vivek Express. Travelling from Dibrugarh to Kanyakumari travels a distance of 4273 km, making it the longest run in terms of total time and distance in Indian Railways. Shortest run by Indian Railways’ train is the scheduled services between Nagpur and Ajni stations situated just 3km from each other. 8. The longest non-stop travel of the railways is the Trivandrum-Hazrat Nizamuddin Rajdhani Express which makes the 528 kilometer stretch between Vadodara and Kota non-stop. In second place is the Mumbai Rajdhani Express that travels nonstop between New Delhi and Kota. 9. Longest station name of the railway network is Venkatanarasimharajuvaripeta on the Arakkonam-Renigunta section near Chennai. The Shortest station name is Ib, near Jharsuguda in Odisha and Od, near Anand in Gujarat. 10. The India railway trains with most stops is 115 halts held by Howrah – Amritsar Express. This record is followed by Delhi – Howrah Janata Express 109 halts and Jammu Tawi – Sealdah Express 99 halts. 11. The least punctual train of the Indian rail is the Guwahati-Trivandrum Express. It is said to be the most unreliable long-distance train in the country. The charted journey time is 65 hours and 5 minutes, but the average delay on a trip is about 10-12 hours. 12. Indian Railways has achieved a new height. The railways owns the world’s highest rail bridge. The bridge is being constructed over Chenab River in Jammu & Kashmir’s Reasi district (Chenab Bridge). The bridge completion will be by December, 2015. Coming up at Kauri, it will be 359 meters (1,180 feet) above the riverbed (five times the height of Qutub Minar and 35 metres taller than Eiffel Tower). Stretching across a length of 424 metres, the bridge on the Panval River in Ratnagiri district, Maharashtra is currently the tallest bridge in India. 13. The New Delhi Main Railway Station holds the record for the world’s largest route relay interlocking system. The station has a place in the Guinness Book of Records. 14. 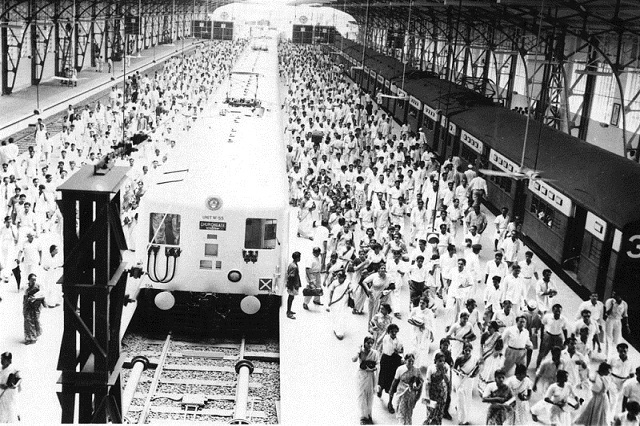 In 1986, Indian Railways started its first computerized reservation in New Delhi. 15. Breaking the previous record of Kharagpur platform (1072.5 m) in length, Gorakhpur in Uttar Pradesh is the longest platform in the world with a length of 1366.33 metres. 16. There are 7,500 railway stations in India. 17. Loco-pilots (train drivers) are paid more than an average software engineer. Salaries are the tune of Rs. 1 Lakh per month and more. 18. The IRCTC (Indian Railways Catering & Tourism Corporation) website gets close to 12 lakh hits per minute. It is the online portal of the railways. 19. Indian Railways still has the oldest preserved locomotive in working order, the Fairy Queen which was made way back in 1855. It is the oldest functioning steam engine in the world, which finds a place in the Guinness Book of World Records and received Heritage Award at the International Tourist Bureau, Berlin in March 2000. The Indian luxury train offers guests an unrivalled experience. 20. The country’s longest tunnel is Pir Panjal Railway Tunnel 11.215 km that was completed in December 2012 in Jammu and Kashmir. The tunnel is yet to become functional railway route. Karbude on Konkan Railways, which is 6.5 km in length previously held the title for the longest tunnel in India. 21. Railways runs as many as 19,000 trains every day. Some 12,000 trains are for passengers and 7,000 for freight. 22.Vembanad Rail Bridge 4.62 km in length in the state of Kerala connects connecting Edappally and Vallarpadam in Kochi. It is the longest rail bridge in India and it is dedicated solely for freight. Nehru Setu Bridge near Dehri on the river Sone is the longest railway bridge in India. The bridge is near Sasaram on Kolkata-Delhi Line. It is 3.065km long. It is the passenger route. 23. Junction with most number of routes originating from it Mathura junction with 7 routes- Broad Gauge (BG) line to Agra Cantt, BG line to Bharatpur, BG line to Alwar, BG line to Delhi, Metre Gauge (MG) line to Achnera, MG line to Vrindavan and MG line to Hathras, Kasganj. Six route junction – Bhatinda. Five route junctions – Lucknow, Guntakal, Katni, Varanasi, Kanpur Central, Villupuram, Dabhoi, and Nagpur. 24. The Northernmost railway station is Baramulla in Jammu and Kashmir. Westernmost is Naliya near Bhuj in Gujarat. Southernmost railway station is Kanyakumari, while the last station on the east of India is Ledo on branch line from Tinsukia. 25. Nagpur located in central India is the site of the Diamond crossing of the Indian Railways. This is one of a kind from where trains go East, West, North and South. 26. The National Rail Museum in Delhi set up in 1977 is a one of the unique museums in Asia. Sprawled over an area of 11 acres the museum has collections like antique steam engines, locomotives, models, carriages, photographs among other things. There are live exhibits as well as working and non-working models. The added attraction is the toy train which runs across the museum. This is a living heritage of the Indian Railways. 27. Indian Railways has a mascot Bholu, the Guard Elephant. 28. The busiest junction in the nation is Lucknow. The Indian Railways cater 64 trains every day. 29. Indian Railways have numerous luxury and heritage trains. Palace on Wheels was the first luxury train. 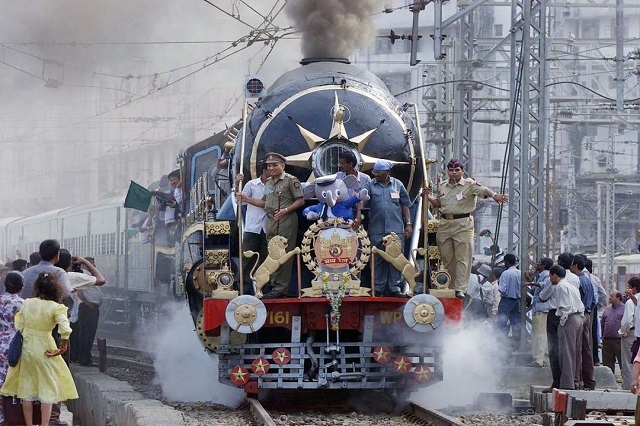 Maharajas’ Express is a recent addition to the luxury trains of India. This 2010 inaugurated train recently won the “Seven Stars Global Luxury Award” in the luxury train category. The other names of luxury trains are Royal Rajasthan on Wheels, Deccan Odyssey and Golden Chariot . 30. Four Indian Railways’ trains have been declared “World Heritage sites” by UNESCO. The Darjeeling, Himalayan Railway (1999), Mumbai CST Building (2004), Neelgiri Mountain Railways (2005) and Kalka-Shimla Railways (2008). Indian Luxury Trains © 2019. All Rights Reserved.